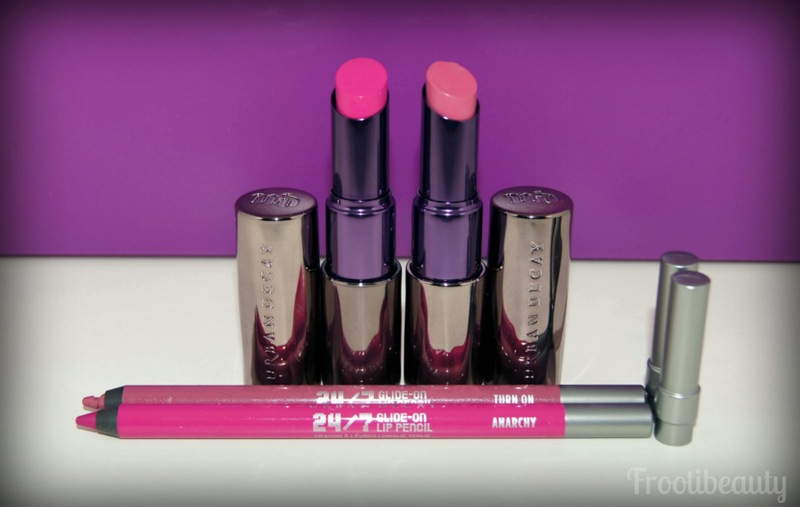 Hey guys, as you may well know, I'm a huge Urban Decay fan and today I'll be reviewing something I've been uber excited about for a long while: the new Urban Decay lipsticks. 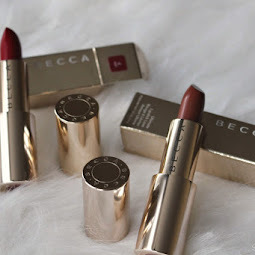 The new lipsticks have been redesigned and reformulated and repackaged.. basically a whole new lipstick, but there are some familiar sounding shades like Revolution, Rush and Jilted. 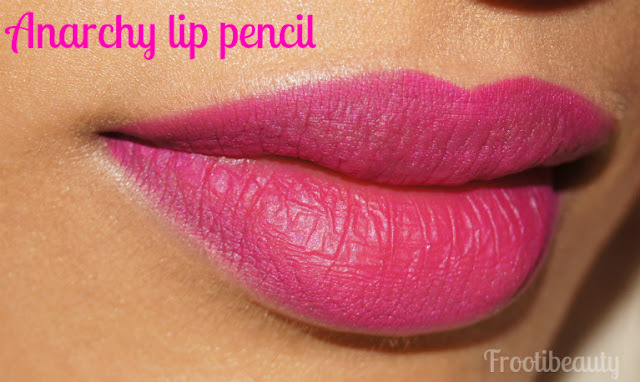 I was sent two lipstick shades: Anarchy (bright fuschia) and Turn On (rosy pink) and their corresponding 24/7 lip pencils (also relaunched). Colour & Pigmentation: As with all the 24/7 range, the pigmentation is gorgeous in both lip pencils. Turn On is a rosy pink shade and Anarchy is a gorgeous bright fuschia with strong blue tones. 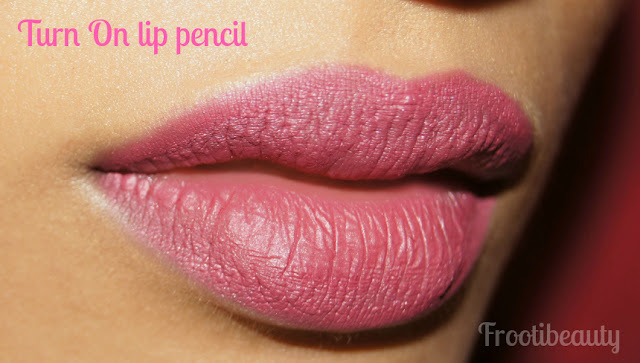 Texture: Both lip pencils were creamy enough to go on smoothly but not with too much slip that the pencil would bleed. I found Turn On to be drier than Anarchy when worn alone. 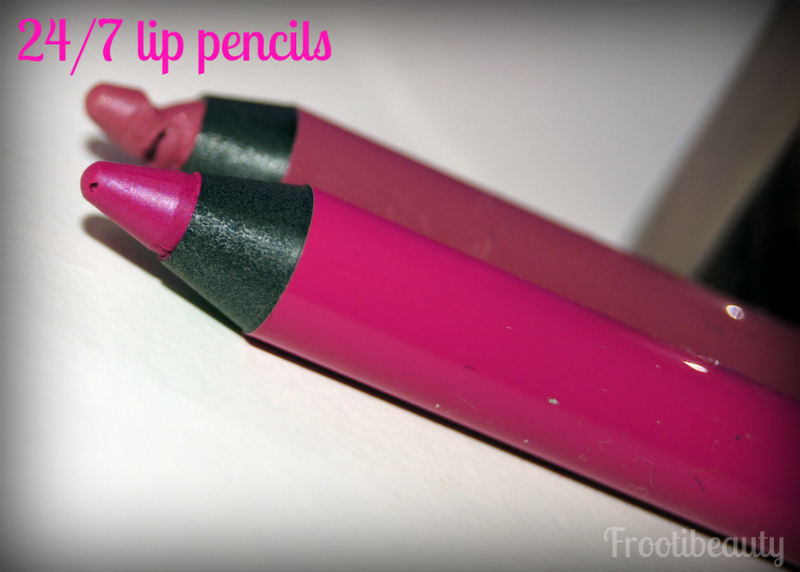 Longevity: When worn alone, these lip pencils can last ages, literally 24/7! 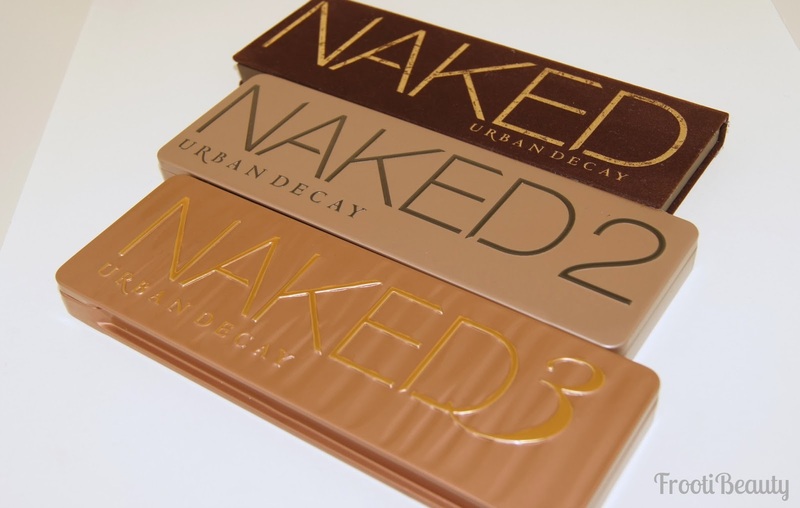 Price: At £12 they remain at the same price when many of the other Urban Decay products have gone up in price; I'd definitely pick up a fair few shades before they do inevitably get popular and go up in price! Colour & Pigmentation: The colours are as described above for the corresponding lipsticks, however I found Turn On lip pencil to be duller than the corresponding lipstick. 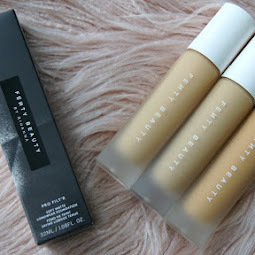 Pigmentation is insane.. absolutely packed with colour in both of these shades. Texture: I found the texture to be utterly creamy and buttery even, like the YSL Rouge Volupte lipsticks, but with more pigmentation. Amazing. Longevity: As these are fairly creamy lipsticks, I'd expect them to wear away pretty fast, however I ate, and wore my Turn On lipstick (with liner underneath) comfortably for around 4-5 hours before I felt it wear away. Price: At £15.50 it's a bit more than a MAC lipstick, but less than its quality equivalent YSL Rouge Volupte which is one of my other favourite lipsticks.. And the packaging is sleek and so me (purple) so for £15.50 it is totally justified in my opinion. All in all, I'm impressed just as I knew I would be, and can't wait to buy more pencils and lipsticks in the range.. My bank balance will hate me but my lips won't! 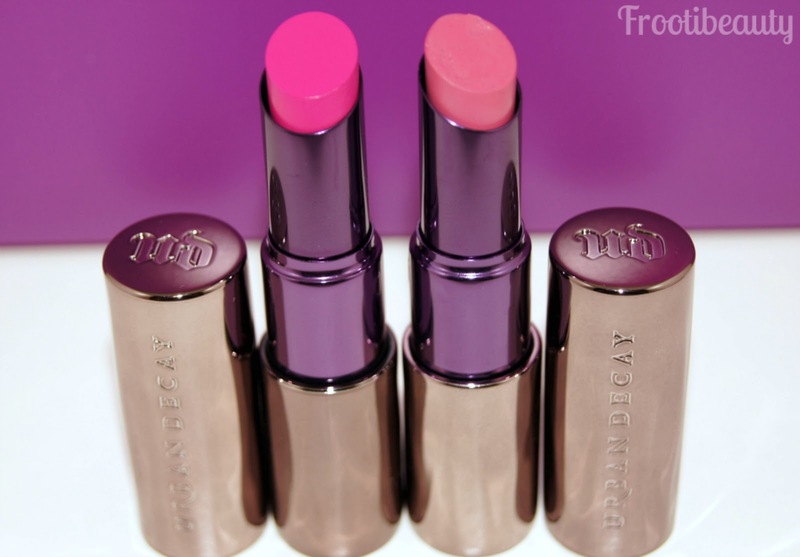 Urban Decay Revolution lipsticks are available to buy at Debenhams, House Of Fraser, and John Lewis. 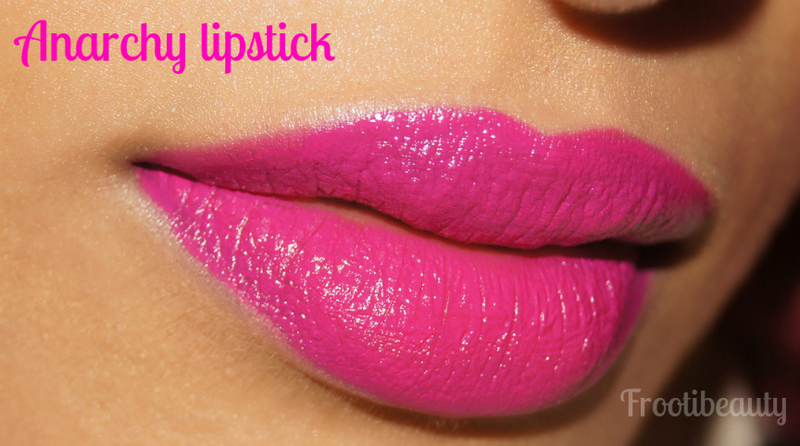 What do you think of these new lipsticks? Have you seen or bought any favourite shades yet? I've recently been trying out a few different brands of brushes (yes other than Urban Decay and Real Techniques!) simply because they are quite limited in their ranges and I wanted to try out a few other brands. I recently saw that HD Brows (the ever popular brand behind amazing brows) launched their brush range and was interested in trying some of their brushes as I'd heard and seen amazing things about their brow products. The Precision Eyeliner brush (£9.95) as the name suggests does have a fine and precise tip, perfect for getting in the inner corners of small eyes (like mine!) or creating flicks. The Contour Brush (£14.95) is possibly my favourite of the three as it places bronzer/contouring shades perfectly with its angled edge, but with a softer finish for those that don't like obvious contouring. And finally the Blusher Brush (£14.95) which adds colour perfectly to the apples of particularly smaller cheeks like mine! 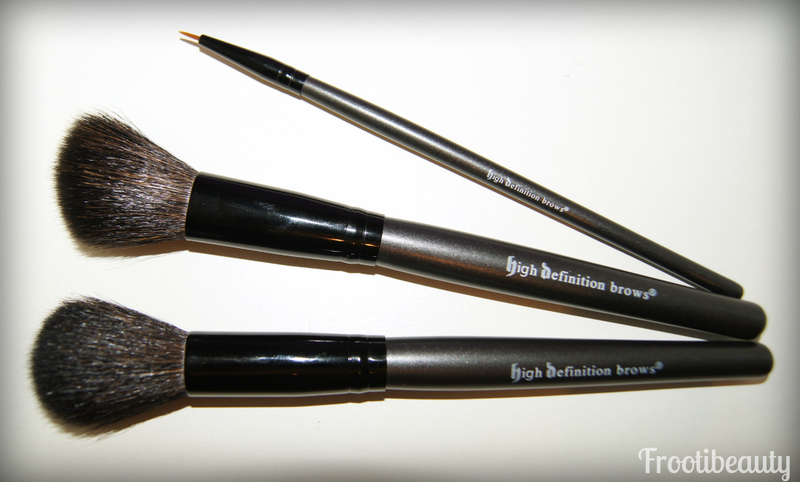 The brushes are fairly soft and the packaging is sleek and feels durable too. I did find that the hair of the Blusher and Contour brushes shed ever so slightly, but other than this I found them decent to use, applying makeup just as I want. The brushes are available to buy from the Nouveau Beauty website. Have you tried any products from HD Brows? 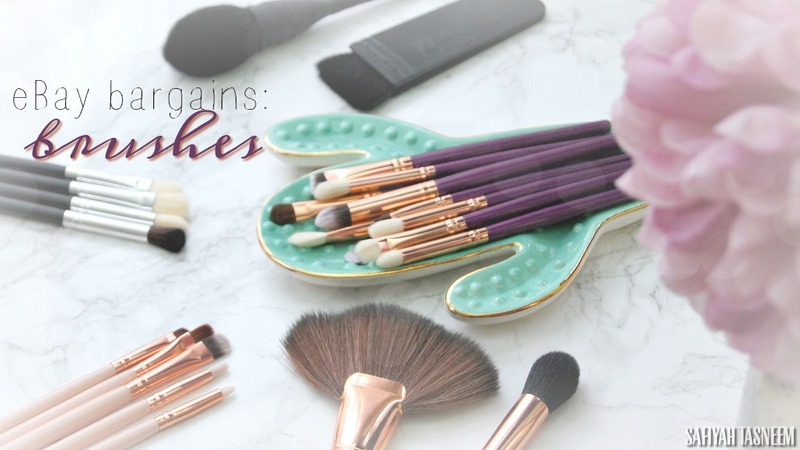 Which are your favourite brushes? Following my last two makeup look posts using Motives cosmetics, I thought I'd post my first instalment of swatches so you guys can see for yourself the quality of the brand. I received a 46 eyeshadow palette which is not available to buy (yet), but each shadow is available individually. Packaging: The palette is fairly heavy and durable with a clear glass front; nice and handy for a makeup artist or professional who wants to see all the single eyeshadow colours in one go. The glass door snaps shut magnetically and each shadow is in a metal pan which slots into the hole slots in the palette. These hole slots have little magnets inside to hold them in so you don't need to worry about them slipping out, unless you need to replace (or check the eyeshadow name) in which case there is a hole to fit a finger through and simply push out the shadow. 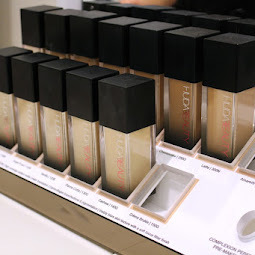 Colour & Pigmentation: As you can see from the above swatches, the pigmentation is generally high in quality. The least pigmented shades were the more matte shades and some glittery shades, where I had to swatch twice to get the best colour. The most pigmented and creamy eyeshadow was Sweet Plum which glided on beautifully and is a gorgeous colour. Texture: The shimmery shadows are generally creamy in texture; though the matte shades aren't as creamy, they are by no means chalky. Longevity: The shadows hold fairly well without primer, but they don't stain like cheaper shadows do so you know they're good quality. A good primer would hold them for ages! Price: At £12 each they're around the same price as a good quality brand like MAC and Urban Decay and in honesty I'm rarely impressed by eyeshadows these days as nothing compares to my Urban Decay shadows. However! I like that these shadows have good colour payoff and the fact that this palette is so easily accessible, so I think I will be using them a lot more either for me or for clients! And there you have it! Motives cosmetics are available to buy at their online website which is slightly limited compared to the US site due to UK mineral cosmetics restrictions, but most of the products are available here too. Do let me know if you have any other swatch requests from the brand and if I have the product I'd be more than happy to provide the swatch. Have you heard of Motives or tried any of their products? As you can see I've been trying more neutral coloured makeup recently, I guess I just wanted to test my new makeup out but I hope you like it anyway; I know this post is a day late but better late than never eh?! 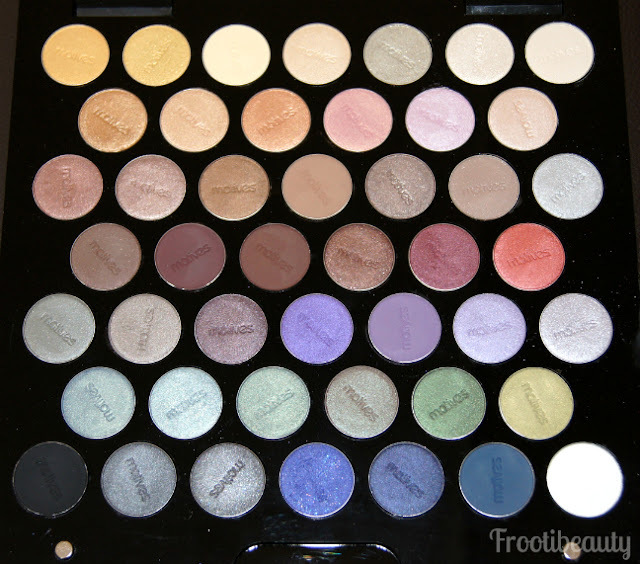 > Pressed eyeshadows in: Onyx, Vino, Chocolight, Hazelnut, Cappuccino, Vanilla, Whipped Cream. 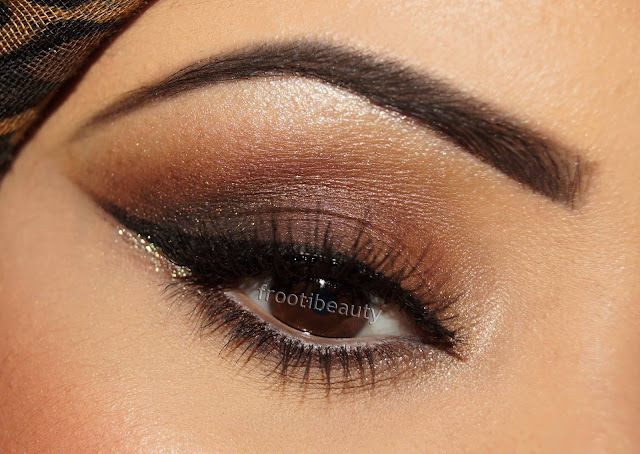 Instead of the usual primer, I used the Luxe Creme Shadows in Gold Dust on the brow Bone and inner corner of the eye and Brown Sugar on the eyelid. I started by applying Whipped Cream to the brow bone and inner corner of the eye, then Vanilla underneath the brow bone, sweeping into the inner eye slightly. I applied Vino to the middle to the end of the eyelid and Chocolight and Cappuccino to the inner eyelid but not on top of the highlight Whipped Cream. 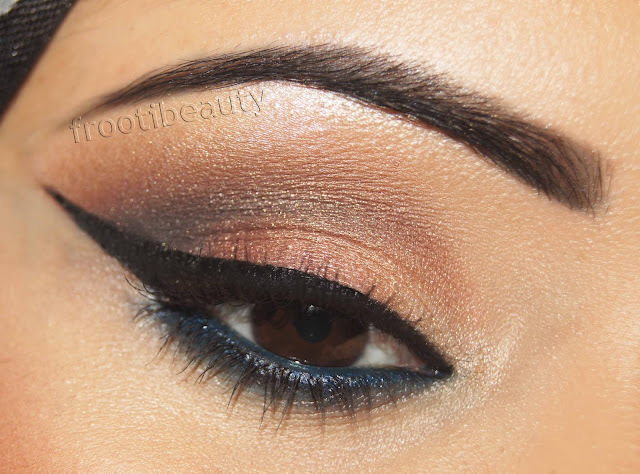 I added Onyx to the outer corner of the eye, blending upwards slightly and Hazelnut just above the crease. After cleaning up on the outer corner, I added the Inglot gel eyeliner for the top liner and lined the top of the inner eye with Khol eyeliner in Black. 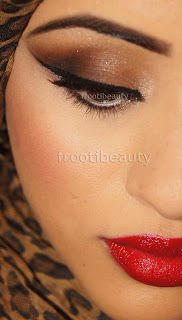 The bottom inner eye was lined with Angel Khol liner and smudged so that it wasn't as white as it draws on! I then went underneath the inner eye at the lash line with Earth Khol pencil. I primed the lashes with the Motives Lash Primer and finished with the Lustrafy Waterproof mascara. For the rest of the face, I primed with the Perfecting Face Primer and used the Cream Foundation Quad by Loren Ridinger in Medium-Dark. I then set the makeup with the Photo Finish Powder in Neutral Medium and used Flushed Blush on the cheeks and the Shape & Sculpt to highlight and contour where needed. And there you have it! 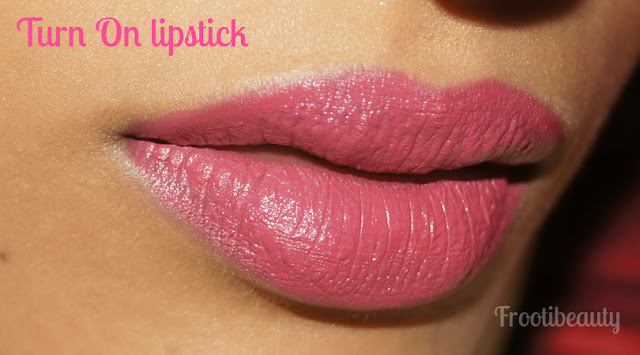 Which lip do you prefer with this versatile neutral look? This week has been a great week of post in the blogging world; I was awoken yesterday by a delivery, two fairly large boxes to be specific. I racked my brain thinking if I'd ordered something but I then realised what it could be and was uber excited. I'd been in contact with Motives cosmetics and they have been posting out amazingly generous care packages to bloggers, makeup artists and Instagrammers but I didn't for one minute think I would receive half as much as these people. I'd say it took about 45 minutes to an hour to unpack the whole lot (yes there was literally THAT much in the boxes) and I just sat there for about 10 minutes soaking it all in! I didn't know where to start but I knew I needed to try as many things as possible so I could gauge what my favourites would be from the range and to of course create a makeup look. 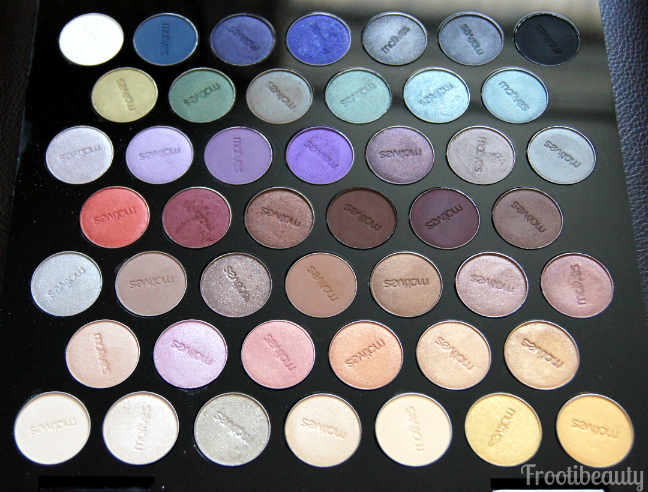 > Pressed eyeshadows in: Whipped Cream, Vanilla, Bronze Beauty, Pink Gold, Cappuccino, Chocolight, Hazelnut, Sweet Plum, Onyx. I started by applying the Eye Base all over the eyes, then highlighted the brow bone and inner corner of the eye with Whipped Cream shadow. I then patted on Bronze Beauty on the eyelid and Pink Gold further along the lid, finishing with Sweet Plum and Hazelnut at the outer corner of the eye. I blended a bit of Hazelnut upwards from the crease, followed by Cappuccino and Chocolight in the crease and Vanilla in between the highlight and the browns above the crease. 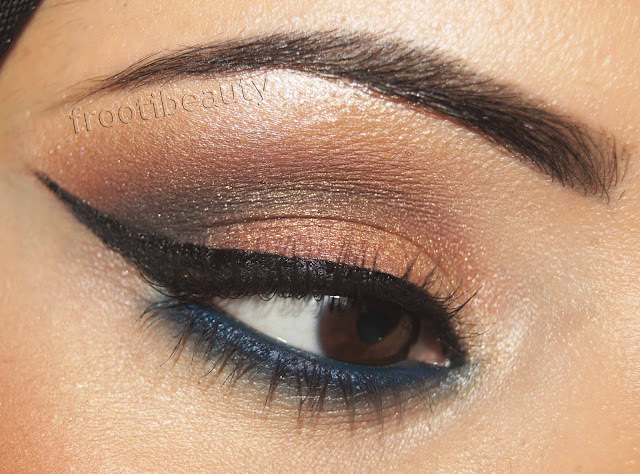 I went back and added Onyx to darken the crease and outer corner slightly. I used Luxe Precision to line the top eyelid and extended it quite far up at the outer corner. Onyx Khol eye pencil was used on the top inner eye and Electric Blue Khol for the bottom lash line (blended slightly with a brush). I then used the Brow brush from Motives on the Onyx Khol pencil to fill in the brows and finished off the eyes with the Lustrafy Waterproof mascara. For the rest of the face I used the Liquid Powder Mineral Foundation in shade Vanilla Cream all over the face and set it with the Photo Finish Powder in Neutral Medium. I contoured the cheeks with the Shape & Sculpt Duo (which I ADORE) as it highlighted and contoured my skin beautifully. I then added a bit of So Peachy blush to the apples of the cheeks. I will be posting swatches of the range I received as and when I can, the range is impressive and I have my favourites already, if you know of the brand and would like to request some swatches or reviews, do let me know below! Which look do you prefer? Have you tried Motives cosmetics before?